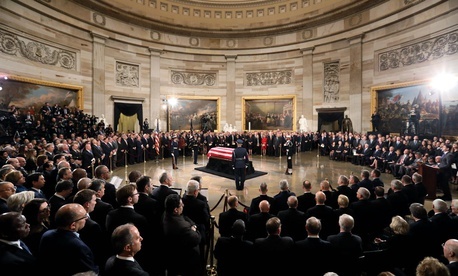 On the hustings, the late President George H. W. Bush presented himself as a Texan with an outsider’s skepticism toward the target-rich Washington bureaucracy. But the 41st president—who died on Saturday at age 94, was a Navy hero, a member of Congress, a U.N. ambassador, a CIA director and vice president before he was elected to the top job in November 1988. Bush’s single term was notable for his foreign policy adeptness at handling a range of crises that emerged in the waning days of the Cold War and its aftermath. He proved a steady leader with the fall of the Berlin Wall and subsequent collapse of the Soviet Union. He put together a stunning coalition of nations to repel Iraq’s 1990 invasion of Kuwait and ordered U.S. troops to overthrow Manuel Antonio Noriega after he seized power in Panama, threatening U.S. interests. But he also worked with Congress to pass bipartisan, transformative laws, including the 1990 Americans with Disabilities Act, which reshaped public spaces for the disabled and prohibited discrimination, and the 1990 Clean Air Act revisions, which curbed pollution resulting in enormous positive health consequences for all Americans. As President Ronald Reagan’s vice president, Bush came to the Oval Office in 1989 already predisposed to cutting government, asserting executive authority and resisting the ambitions of the Democratic-controlled Congress. A lookback through highlights from Government Executive magazine’s coverage of his four years in office reveals some familiar themes. In charge of handing out agency jobs from the White House was Director of the Office of Presidential Personnel Chase Untermeyer. He reportedly intended to “enjoy the luxury” of the first friendly presidential takeover in 60 years by keeping Reagan appointees in place while searching for their successors. “I’m not under any pressure to slam-dunk people into jobs in the agencies,” he said. Government Executive reported in August 1989 that “Bush is setting a new standard for rewarding political allies and benefactors with U.S. ambassadorial posts. Out of 37 ambassadors Bush nominated by July 14, only 30 percent were career members of the U.S. Foreign Service. By April 1990, Government Executive reported that the Bush transition had been the slowest in at least 20 years. One appointee who would have a significant impact on federal employees was Constance Berry Newman, who Bush tapped to lead the Office of Personnel Management. She was a veteran of 12 agencies, including the Housing and Urban Development Department and the Consumer Product Safety Commission. “I think she’s learned a few things on her way up,” Bush told a gathering of Senior Executive Service members. Unions were just pleased that she was not Reagan’s controversial OPM Director Don Devine. The 1990 Federal Employees Pay Comparability Act aimed to remedy years of neglect in federal compensation and make the civil service more competitive with the private sector. The Defense Department was not exempt from the effort. “The Pentagon Squeeze: Introducing the Leaner Defense Department of the 1990s,” read the Government Executive cover in February 1992. The Pentagon announced plans for a 25 percent reduction in force structure. Active-duty troops were to decline from about 2.1 million in 1990 to 1.6 million in 1997. The perennial issue of when agencies should rely on contractors was also high on the Bush agenda. “OMB is developing a list of inherently governmental functions that should never be contracted out, scrapping a Reagan-era interpretation of Circular A-76 that virtually mandated contracting out and cut agencies’ budgets in advance based on projected costs savings,” Government Executive reported. It was a sentiment he clearly believed, as demonstrated through his life of service.